The apostle Paul, assigned by God to preach the mystery of the gospel to the Gentiles, expressed this responsibility as preaching Christ, Christ alone, and Christ crucified (Colossians 1:26–29). Paul fully comprehended that it is Christ who is the theme of Old Testament prophecy and necessarily the theme of New Testament preaching. For Paul the entire missionary enterprise is aimed at fulfilling God’s ultimate purpose: that His Son be worshipped by those from every tribe, tongue, and nation. This is the ultimate destiny for those who believe. Paul’s priority, therefore, was preaching a biblical Christ and so must ours. So, I would say to every preacher, every evangelist, and every missionary that the benchmark of legitimate ministry is their devotion to the biblical teaching of the person and work of Christ. If there is any diminishing or deviation from proclaiming the true Christ, they are in violation of the purpose of God as revealed in the Scriptures. 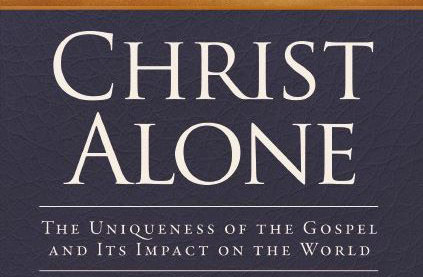 If the theme of the Bible is Christ, then the legitimacy of Christian missions is tied inextricably to a consuming preoccupation with enabling the lost to know all that has been revealed about Christ—to understand His full glory with a view to worshiping Him, honoring Him, and loving Him. In every age, there are extensive and effective lies about the Lord Jesus Christ. Many preach Christ, but they preach a false Christ, violating the features of a biblical Christology. The apostle John warns that there will be many antichrists. This is the strategy of Satan to confuse and mislead those who are lost. He intends to keep them in darkness by sophisticated imitations which appeal to man’s self-centeredness. Antichrists, who are fashioned in the image, not of the true God but of man, offer works-centered religious systems. These systems keep sinners enslaved, believing they are genuinely following Christ. The closer we come to the end of the age, the more pseudo-Christs and false Christs will appear. In every age, there are extensive and effective lies about the Lord Jesus Christ. Many preach Christ, but they preach a false Christ, violating the features of a biblical Christology. If you fail to love the true Lord Jesus Christ, 1 Corinthians 16:22 clearly states you’re cursed. Every man must be believe in the biblical Christ, not a Christ of their own imagination; not the Jesus of liberalism, not the Jesus of liberation theology, not the Jesus of the prosperity gospel, not the Jesus of Mormonism, not the Jesus of Islam, and not the Jesus of Catholicism. This deadly practice has even found its way, amazingly, into evangelicalism. The confusion that comes from this is worldwide; it’s global. We are here to declare what the true church has declared through all its history—Christ as revealed in Scripture. We must get it right about Christ. Salvation comes by believing in Christ. The apostle John makes it perfectly clear that his gospel account of the life of Christ was written so that we “might believe that Jesus is the Christ, the Son of God, and that believing have life in His name” (John 20:31). He would later write, “every spirit that confesses that Jesus Christ has come in the flesh is from God” (1 John 4:2). When you hear a true Christology, you have a messenger from God. “And every spirit that does not confess Jesus is not from God; that is the spirit of antichrist, of which you have heard that it is coming, and now it is already in the world” (1 John 3:4). That’s the test. Christology is the test. If your Christology is aberrant, you’re not a true messenger from God. If your Christology is aberrant, you’re not a true messenger from God. I am grateful for the men who teach in the pastoral training centers affiliated with The Master’s Academy International. Their daily commitment is to equip church leaders around the world to faithfully declare the biblical Christ. These men minister in the immediate contexts of dominant false religions and faulty teaching propagated by Western missionaries. Their students are committed pastors, honing their exegetical skills to accurately preach Christ. It is my great joy to observe their faithfulness to the truth and regularly hear testimony of the gospel impact they are having. The Men of TMAI extol the necessity of a sound Christology, for a sound Christology will inform a sound missiology. This is the great need in missions today and these men’s work is essential, assuring that the church which bears His name will faithfully proclaim the saving truth of Christ alone.